In a bid to focus on most crucial business operations, organizations across the globe prefer offloading routine data entry tasks to offshore outsourcing companies. Non-core yet crucial, data entry remains an integral part of the document management business and calls for scrupulous quality checks as the success of your project depends on error-free data reproduction. India has an extensive database of qualified professionals with adequate computer knowledge, enabling outsourcing firms to follow clients’ processes and methodologies to perfection without expensive overheads. Outsourcing data entry projects to skilled workers in India will, therefore, ensure cost-effectiveness and quality output while your key resources remain free for core activities. Located at the Silicon Valley of India, the Bangalore-based Consystent Infotech offers a full spectrum of reliable data entry services with guaranteed accuracy levels, competitive pricing, and fast turnaround time. Collating and composing data from survey forms require fast and error-free data entry skills. Our well-trained staff members compile and key in all relevant information to generate comprehensive reports as per clients’ requirements. Efficient inventory management requires substantial data processing. From initial compilation of material receipts and issue notes to final report generation, our experts can help you with the entire process of inventory control. Our professionals capture time-office & payroll data most efficiently and also generate accurate reports to meet your organizational goals. With Consystent Infotech as your outsourcing partner, transferring data from an old system to a new one is never a daunting task. Our well-trained staff can ensure error-free data transfer and quick turnaround to meet your requirements. 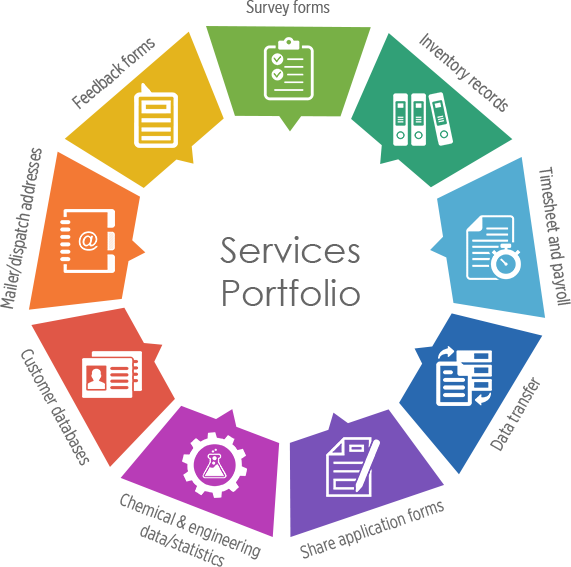 Our skilled staffs ensure accurate compilation of share application forms so that you may serve your customers better and retain customer loyalty. We have expertise in composing engineering & chemical data/statistics to ensure smooth progress of your project. To tap the potential markets for your products/services, it is essential to target the right audience. Consystent Infotech creates relevant customer databases to enhance your business prospects. In order to build upon customer relationships, an organization needs to keep the address lists updated for circulating necessary information. Our proficient data entry operators will keep the mailing lists up-to-date for smooth dispatch operations.